The constellation Crux 'the Cross' (usually referred to as 'the Southern Cross') is the smallest constellation in the sky but it has held an important place in the history of the southern hemisphere. The brilliant cross that is formed by the brightest stars makes it one of the most familiar sights to southern hemisphere observers and the constellation has been used as insignia on the flags and stamps of many southern hemisphere nations, including Australia, New Zealand, Brazil, Papua New Guinea and regions of Chile and Argentina. Ptolemy recognised the stars as part of the constellation Centaurus where they marked the bottom of the hind legs and were thus (as were all the stars of the 'equine part') denoted as akin to Venus and Jupiter in influence. In ancient times, and around the districts of Egypt and Babylonia, the stars were visible low on the horizon, but the effect of precession has lowered them further to the south so that, over time, they became invisible to northern hemisphere astrologers. Currently they are no longer visible in latitudes higher than the tropic of Cancer. The stars were 'rediscovered' by European navigators who explored the southern territories in the early 16th century, at a time when the group lay almost perpendicular to the horizon. The impressive sight of the 'Holy Cross' was more than a morale boost to their efforts, since studying the constellation's inclination from the perpendicular allowed navigators to calculate time and location. Vivian Robson suggests that the constellation was instrumental in the naming of Brazil as the 'Land of the Holy Cross' by its discoverer Cabral on May 1st 1500. 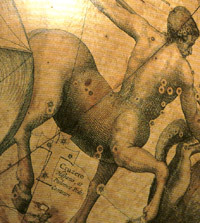 In 1679 the French astronomer Augustin Royer officially identified Crux as a separate constellation to Centaur, though surrounded by it on three sides. The Illustrations below demonstrate how its stars were depicted on star maps before and after the re-classification. 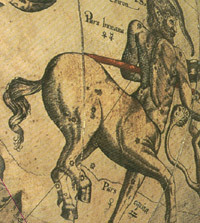 Ancient identification with the bestial part of Centaurus, gives the bright stars of Crux similar associations to those of Bungula, on the hoof of the Centaur's right foreleg. Linked to the mythological figure of Cheiron by Eratosthenes as early as the 2nd century BC, Bungula has been used to signify sacrifice, healing and the need to be healed, and the quest to override base instincts for the sake of collective benefit. But with Bungula there is also the theme of needing to steady the instincts, to maintain emotional control and to conquer motivations of personal gain or private satisfaction. When afflicted, it can equally point to damage caused through unbridled emotions, inappropriate greed or lust, animalistic passions and violent retribution. ... perseverance, but many burdens, trials and responsibilities, together with much suffering and many hardships. As the principal star, Acrux (the name is an abbreviation of alpha Crucis) acts as a focus for the symbolism of the constellation. This is a brilliant blue-white star, the twelfth brightest in the sky. Robson claims that it gives "religious beneficence, ceremonial justice, magic and mystery", and that it is frequently prominent in the horoscopes of astrologers and occultists. No doubt the European explorers saw the sign of the cross in the sky as a potent symbol of blessing for their endeavours to bring Christianity to new lands; but their exploits were never easy and others have pointed to the constellation as expressing a danger of wounds or accidents, or of 'the cross' being symbolic of heavy responsibilities and suffering, such as that which Christ endured in the crucifixion. The other bright stars of the group include Gacrux (from Gamma Crucis), a brilliant red star at the top of the cross, and Mimosa (or 'Becrux' from Beta Crucis) on the eastern beam. Delta Crucis, on the western arm, remains unnamed and unexplored by astrologers. The Cross is the smallest constellation, but the most familiar to observers in the Southern hemisphere because of its shape and the brightness of its stars. Acrux, at the base of the cross, is only visible from locations south of the tropic of Cancer. The Sun crosses Gracrux around 30th October, and Mimosa and Acrux around 4th November each year. 1 ] Ptolemy, Tetrabiblos, (1st century AD), Harvard Heinemann, Loeb Classical Library; 1.9. 2 ] Robson, The Fixed Stars and Constellations in Astrology, 1923, p.41. 6 ] London: Routledge, Kegan & paul, 1962. Translated from the Spanish by Jack Sage; pp.68-71. 7 ] Granville train disaster: 18th January, 1977, 8:03am AEDT (-11hrs), Sydney, Australia. © Deborah Houlding, April 2006.